Villas and Fincas has good knowledge of the local area and market, worked with several property surveyors and is, therefore, able to provide an accurate valuation of your property. We provide a clear and simple sales commission agreement, giving a description of the property and specifying the total selling price and commission for the completion of the sale. Any furniture, paintings or fittings included in (or excluded from) the selling price should be clearly described to prevent misunderstandings at the time of sale. The vendor is asked specifically not to withhold any important information with reference to the property and to provide a copy of all documents required by law. The vendor must be aware that by law we will keep all the data with reference to the property until 5 years after the sale. When we’ve come to an agreement with a purchase, Villas and Fincas will prepare a letter of intent, which will be signed by both parties. The letter of intent is a token of good will from both parties. 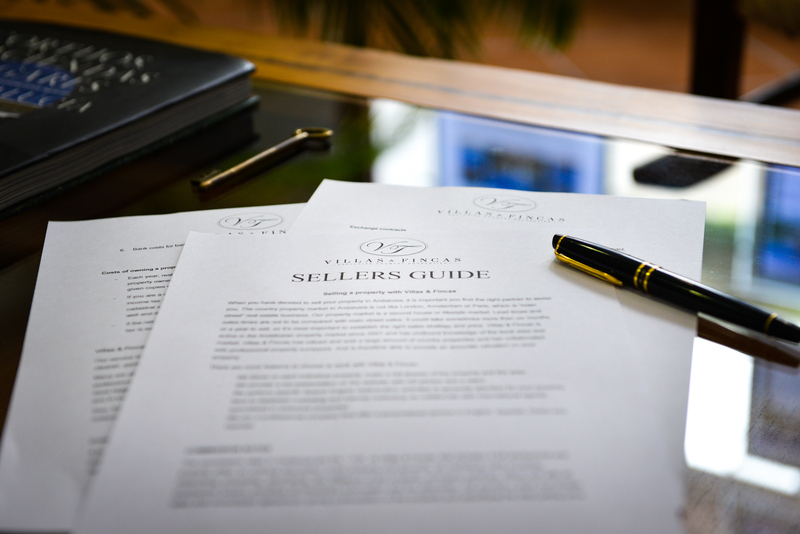 It states the sales conditions and the time reserved for the purchaser’s lawyer to draw up a private purchase contract. Which is the next step: to exchange private contracts drafted and negotiated by respective lawyers and monitored by Villas and Fincas. This usually happens within two weeks of signing the letter of intent. In the private contract (contrato de compraventa, or contrato de opción de compra) the parties, the property, the price, the method of payment the date of completion, and other important conditions must be specified and described clearly and in detail. The completion normally takes place at a public notary when the possession is handed over to the purchaser and the balance of the purchase price is received by the vendor. Estate Agent’s Commission is 5%, plus IVA. These costs can be deducted when calculating Capital Gains Tax. Legal Fees Normally a standard lawyer’s fee is 1% plus IVA and can be deducted when calculating Capital Gains Tax. 21 % on the difference between the original purchase and current selling price. Both residents and non-residents have several possibilities for deductions. It goes too far to specify these here. It is best you ask your lawyer or fiscal adviser how to proceed. When the vendor is a non-resident in Spain or a resident that cannot prove fiscal residency, the purchaser’s lawyer will withhold 3% of the purchase price and pay it directly to the Tax Office within a month as a payment in advance on account of Capital Gains Tax. Municipal ‘Plusvalia’ Tax paid every time a property is transferred and based on the increase of the value of the land during the time that the seller has owned the property and calculated in accordance, it does not depend on the selling price. This payment is subject to negotiation between buyer and seller and should be stated in one of the clauses of the private contract as to who is responsible for this cost. If nothing is stated in the contract, by law the vendor is to pay this tax. Make sure any home improvements, updates, extensions have been registered. Copies of most recent water, electricity and telephone bills and IBI bills. Rates, garbage collection, community regulations/statutes, alarm contract, insurance policy, building plans and administrative licenses. Indication of Plus Valía Tax from the Town Hall. Certificate from the Community of Owners. THIS IS A GUIDE ONLY AND IS NOT TO BE TAKEN AS READ PLEASE CONSULT A LAWYER.